Volunteers at Waratah Park - picture supplied. Sunday March 22nd, 3.00 a.m. The word is now out about the great rehabilitation facility we have built with the help of your kind donations. We are now taking in more wallabies and kangaroos (macropods) from vets and members of the public from further afield as they have heard how successful our rehabilitation area has been. We have received numerous requests to build rehabilitation facilities for other species. As a result, we will be expanding the scope of this project to include rehabilitation facilities for other native wildlife. Sydney Wildlife prides itself on giving the animals that come into our care the best chance of survival once re-released back into their natural habitat. By having purpose built rehabilitation facilities for all species in our care, they would all be able to benefit from increased fitness and the ability to socialize with other members of their species which makes the transition back into the wild more successful. We hope that you will continue to support Sydney Wildlife in our effort to provide great facilities for all of our native wildlife. Tell us what you think of our expansion? 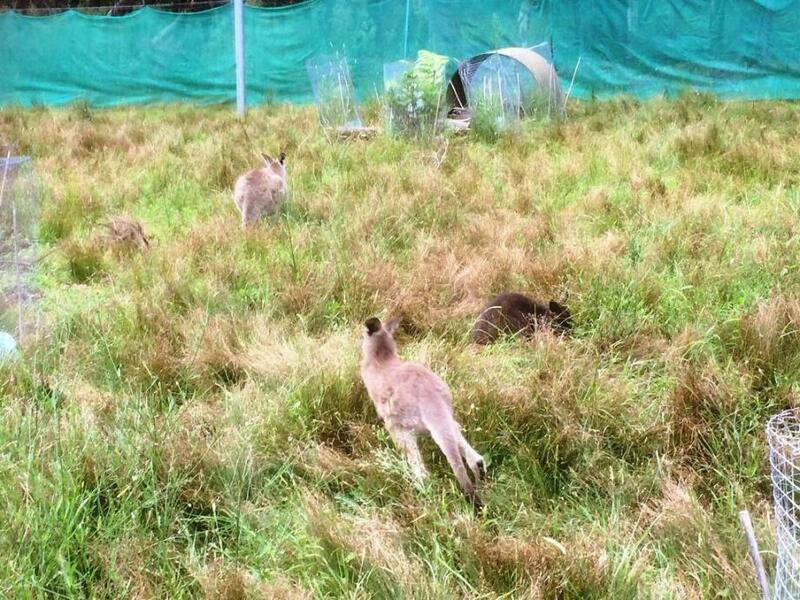 Since our last report, we have had 7 rescued macropods come through the facility. While looking after this many animals in the facility can be expensive with ongoing food and vet bills, it is a joy to know that because of your help and donations we have been able to give them the best of care and release them back to the wild in peak fitness, when healthy and/or old enough. Snives (Rescued from St Ives) - Adult Swamp Wallaby - was found stuck behind a shed in the backyard of a member of the public with grazes and bruises on its legs from trying to break free. After being picked up from the vets and being given treatment for her injuries, she has now fully recovered and is due for release. Valentine (Rescued on Valentines Day) - Juvenile Eastern Grey Kangaroo - was seen daily over the course of a week visiting several backyards without a mother around. Sydney Wildlife and vets were called in to capture Valentine. As Valentine was wild and frightened, she was darted to sedate her and enable the Sydney Wildlife volunteer to capture her and transport her to our facility with minimal amount of stress or danger to herself. She has now put on weight but as she is still quite young and should still be with her mother, she will be in the facility for a while before we can safely release her back in to the wild. 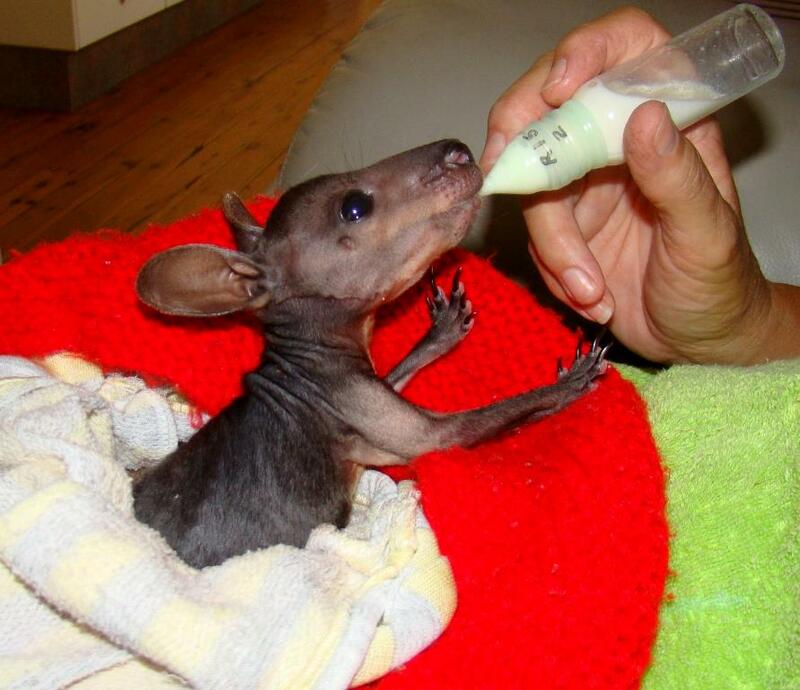 Sydney Wildlife is an Australian organisation run 100% by volunteers. Across this big city, Sydney Wildlife volunteers rescue native Australian animals including many Wallabies and Kangaroos. The orphans need 24 hour care after accidents which include being hit by cars, caught in bush fires, or surrounded by floods. Up until now, our volunteers have had to care for and rehabilitate our injured and orphaned Macropods (Kangaroos and Wallabies) in their own homes and backyards. Sydney Wildlife has been lucky enough to secure a lease for part of Waratah Park (former home of "Skippy") and thanks to the funds we have received towards this project, we can now start building a suitable facility that accomodates their complex requirements before release. Our hardworking volunteers have started to clean the area in preparation to build our facility for Macropods. We have spent several days clearing out sheds, mowing and weeding. These areas will become our rehabilitation facility and quarantine room. On top of the physical work we have been doing, we have also been taking measurements and getting quotes to get the best price possible to build our facility. Shadow's Story: Rescued after his Mother was hit by a car, Shadow requires care for 12 months before release. For the first part of his life he lived in a man- made pouch. Shadow needs to learn to hop around and strengthen his bones and muscles in a safe area away from danger prior to release. To build up Shadow's muscles and those of other rescued Wallabies and Kangaroos we need a large fenced area for them to hop around in, developing their natural skills. By building a large fenced area and shelters we would be able to allow the kangaroos and wallabies to safely exercise without the threat of predators, and thus be fit enough to get away from danger and survive when released back into their natural habitat. By releasing healthy kangaroos and wallabies we are ensuring the preservation of our unique wildlife in this city.